What should you consider when buying miniaturised cast jewellery? 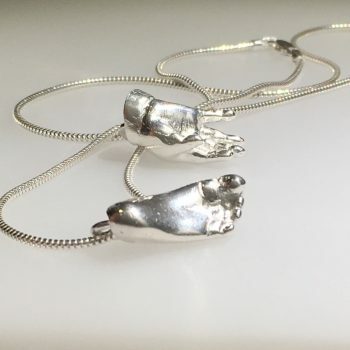 Imagine being able to wear YOUR child’s casts, miniaturised into a luxurious piece of jewellery? These gorgeous little treasures might be small in size, but their impact is anything but. These will be certain to leave a lasting impression! Well, they are not as readily available as many other keepsake charms. They are a more elite product and they are a bigger financial investment too. You will firstly need a lifecaster and also a jeweller who knows how to create these. How do you choose a maker? I started to make ‘Tiny Treasures’ almost two years ago. They are the single most expensive item I am yet to create, and with good reason. These need lifecasting skills, technological investment and training and jewellery making skills. The first examples I saw of these little miracles had me fascinated…as always, my mission at Impressive Memories is to create a beautiful product with a price that reflects that. The first examples of this style of jewellery were (understandably) extremely expensive. The new mums heading home from Londons Portland Hospital were wearing them…why shouldn’t every new mum be able to? Why am I more affordable than the small number of other makers of miniaturised charm jewellery? My pricing is based not on what others charge, but on how much these miniaturised charms cost me to create. I know my method is different to the other makers because I developed it myself. Before investing in these beautiful future heirlooms I would expect you to research other makers and compare them. I have chosen 2 companies, and myself, and answered 10 points that I think are important decision factors to choose the right maker for you. These are my personal views and all information is provided in good faith to be accurate. Before making any purchase I would advise speaking directly to each company. Artu creates individual, contemporary and artistic portrait sculptures and bespoke heirloom jewellery. Is the life casting Included? Single charm in Sterling Silver £370, Pair £654. Single charm in Sterling Silver £297, Pair £539. Up to four split monthly payments to spread the cost and let you capture the moment. Impressive Memories online shop is protected by a secure https address and online purchases are made through Paypal, offering you their full protection. If you visit in person you can choose to pay by cash or I also accept most major credit & debit cards. The charms do not need to be hallmarked but can be. Business Established in 2011, casting since 2003. 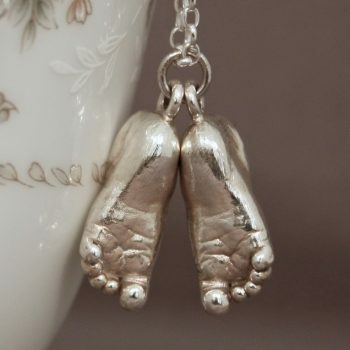 Pair of charms in Sterling Silver £1950. At Impressive Memories I invite reputable, experienced life casters to work in partnership, on a recommendation basis. If you are interested in joining my partnership please get in touch. Drop me a message and we can have a chat. I do not make wholesale items or sell through a third party. I can cover most locations in the UK should you want to have casts taken by a recommended partner, then have your charm made by me. If, in the unlikely event, you developed an issue with your miniaturised charm…I know every stage the charm went through to create, and it is my skills that bring the product to my customer. I do not rely on a third party. If an issue arose with an item ‘bought’ through a wholesale option, who would rectify any queries or issues? It would be worth checking any terms and conditions regarding this before you invest. I do not make Impressive Memories charms for anybody else to sell. If I make miniaturised charms by collaborating with a life caster elsewhere, you are still purchasing your miniaturised charm from Impressive Memories. My work is handmade, by me. My method to make the charms is a method developed by me. I use some very high tech procedures, but I make my charms by hand. This means I cannot offer the same level of discount on duplicates because there is very little difference in making a duplicate to making an original. If the more standard method of lost wax casting is used, then duplicating a charm is a much easier process – I do wonder then why the reduction in production costs isn’t significantly reduced for the customers? I accept this may make my jewellery more expensive if buying multiples but my feelings are that each piece I make is never identical to another. I do not duplicate. My charms are all different, each and every one – just as your child is – 100% unique, so is your Impressive miniaturised charm. I also offer miniaturised dog paw charms. If you’d like to replicate YOUR dogs paw into a charm, I can do this for you. I accept these charms are more expensive than most that I make (fingerprint & miniprint charms), and babies are not cheap commodities! This is why I offer the split payments option. This means you capture the moment and then split the cost of your charm, safe in the knowledge the memory is impressively captured. I am not aware of other companies offering this, but cannot be certain. If you know that you NEED these in your life RIGHT NOW…then go for it!! 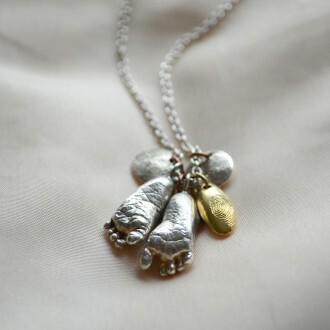 Be Impressively bold and show the world how Impressed you are with YOUR child’s beautiful miniaturised hand & foot charms.